The time has come to raise some funds for the home stretch of a real estate project. I am offering up this Fisher Carrera. A few years ago one of my contacts reached out to me. He is a jewelry store owner in the midwest, and he inherited the store from his father in law. 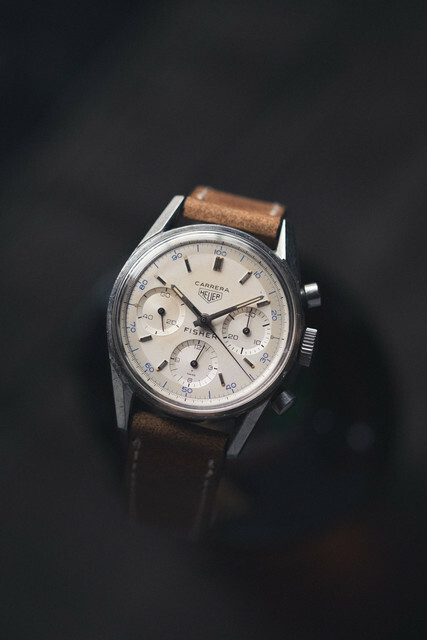 One day, he was going through a watchmaker's bench, and found this Carrera in the back of a drawer. He speculates it had been there for decades. The watch has one set of service marks on the inner caseback, but it appears to be service marks from the 1970's. Upon receiving the watch, I have not modified it in any way. I believe all of the watch to be original. I believe the unsigned crown to be original and correct to the watch, however I will leave that up to the vintage Heuer experts. 1) the bottom pusher cap is not on straight. This does not interfere with the operation of the chronograph. 2) The hour counter hand does not reset to zero, at least not normally. It has reset to zero, however, on a few random occasions. 3) the patina on the dial is toasty and attractive, and there is a little extra patina in and around the left subdial. I am asking $8,000USD or nearest offer, if by chance nobody wants to pay full price after a few days. I am short on time these days, so please limit inquiries to serious ones, and I will happily send all of the photos I have. You can also see more photos @faded_lume on instagram. The watch is to be supplied on a brand new brown horween strap.